The embedded video may be a little larger than life but when an aircraft banner rolls past the shoreline, it certainly captures the public's attention! There are times, when the weather gets so bad, that you have to be a little creative in having a banner flown! This afternoon, while spring-like sunshine covered parts of Kent, Rochester airport was bathed in fog, drizzle and the occasional dusting of snow for much of the day and nothing was moving on the runways. By lunchtime, it became clear that there was very little chance of lifting Lloyd's proposal to Charlotte over the cloud-locked hills towards Detling, only a few miles away and so I suggested that he drive her to Rochester airport, where at least I could have a try at picking-up the banner and working at low-level inside the airfield circuit. Kelvin Carr, Rochester's operations manager, very kindly invited the couple into the control tower, while I quickly got off the ground to pick-up Lloyd's proposal. 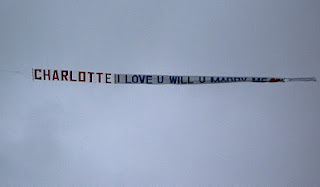 In the mixed drizzle and sleet, collecting the banner was nothing short of a miracle, given the poor horizontal visibility but fortune smiled on the couple and off it flew on the very first attempt. You can see how wet it was by the curl in the sodden banner,making it less than aerodynamic. 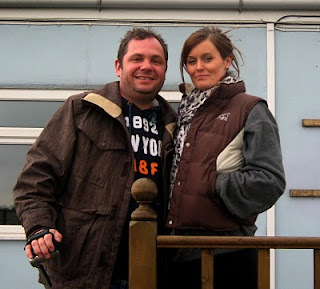 Airads would like to offer our congratulations to yet another happy couple on what has proved to be one of our busiest months for marriage proposals since before the recession began. Another successful Airads Valentines' banner this afternoon at Leeds Castle in Kent. Congratulation to Kevin and Veloshini who came all the way from South Africa to stay at the picturesque castle in Kent, for Kevin to 'pop the question' just after they arrived. 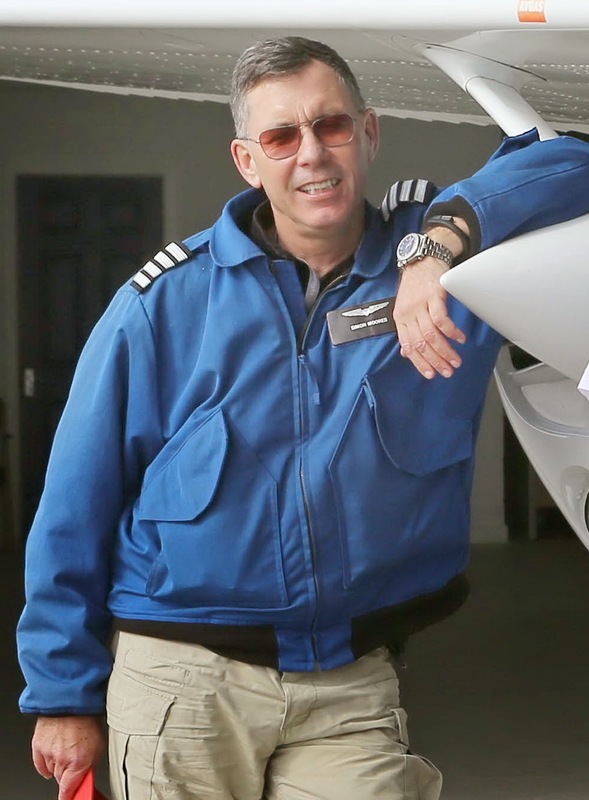 He called me in the aircraft to announce yet another successes in Airads unbroken record of flying proposals! Given the weather, they were incredibly lucky to find enough of a gap for us to operate in. Sixty minutes later, the weather had closed in again. 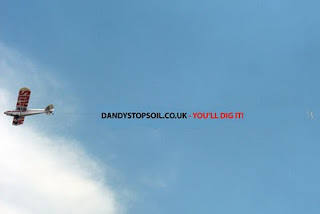 It is estimated that over 100,000 people saw Dandy's Top Soil's latest form of advertising, their 60ft Advertising Banner being towed 600mtrs high by a Plane. The Plane, which was destined for Chester Racecourse, where 41,000 people where enjoying the City's Family Day while watching the world famous races, took off from Blackpool Airport at 1.30pm, flying down the Northwest coastline over St. Annes, Southport, Ormskirk, Liverpool, Widnes, Runcorn, Ellesmere Port and finally Chester itself arriving on the scene at around 2.00pm. The Plane towed a 60ft advertising banner with the letters: DANDYSTOPSOIL.CO.UK behind it. After circling the City centre and Course for over an hour the plane then moved north to the World Famous Chester Zoo where thousands more visitors and tourists were enjoying the sites the Zoo had to offer. After one final lap of the City Dandy's Advertising Plane headed north back over Warrington and Liverpool City Centres to it's final destination back at Blackpool Airport. The total flight lasted two and a half hours and could not be missed by anyone who was outside and within 2 miles of the plane. Adam Dandy commented "It was a great success! If they didn't know who Dandys Topsoil were, they do now!" The first fairy-tale proposal of the year today over Leeds Castle in Kent, which along with Brighton Pier in the summer months, is our most popular aerial proposal choice. Today it was the turn of Jaysen and Neelam and despite the damp February weather, the fog lifted long enough to maintain Airads unbroken 100% proposal record to date. Congratulations to the both of you and a long and happy married life to come!